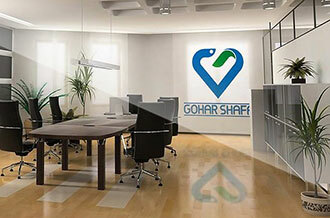 Gohar Shafa Co. offers multiple stent choices in design, length and coating to assure you the right stent match with each procedure and anatomical requirement. 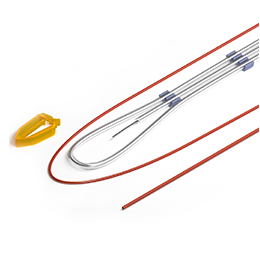 Our ureteral stent offers many advantages. Lubricious coating promotes ease of insertion Ultra-smooth stent surface allows virtually frictionless passage through delicate ureter. 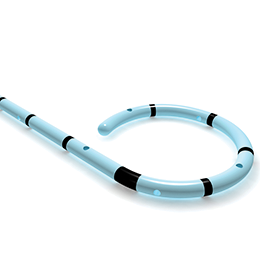 Up to twice as lubricious as other ureteral stent When fluid-activated, stent surface becomes hydrophilic, forming a “cushion” between stent and tissue for smooth, frictionless insertion. Tapered stent tip for navigation around obstructions. So ftens up to 40% at body temperature As stent reaches body temperature, it has been shown to soften by as much as 40%, promoting enhanced comfort and minimal friction. Double pigtails help resist Migration High retention coils at each end of stent help prevent migration while indwelling. Prior to use, immerse stent in sterile water or isotonic saline to allow the hydrophilic surface to absorb water and become lubricious. This will ease placement under standard conditions. These Inst:ructions for Use are provided for informational purposes only and are not intended to take the place of product labeling. Knowledge of physician specialists with comprehensive knowledge of the indications, techniques and risks of the procedure is preferential to this instruction for use. Periodic evaluation is advised; stent must not remain indwelling more than 1 months.